A poor and desperate town oppressed and threatened by a greedy land baron hires an assortment of outsiders to defend their home and livelihood. It’s a tried and true reusable formula that has proven over and over again to be a reliable and satisfying storytelling premise for any genre. So then it should be no surprise to anyone that we have another “Magnificent Seven” in theaters. 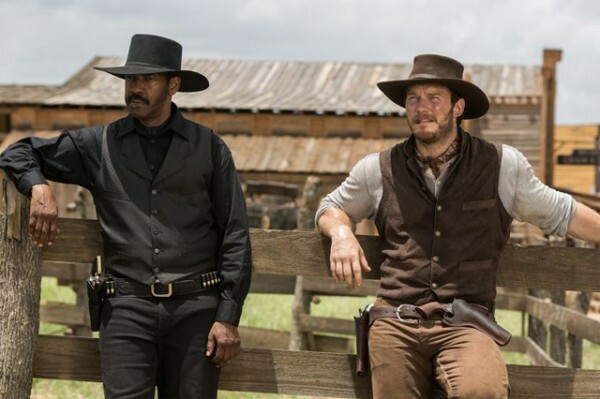 The concept worked back in 1960, when United Artists released John Sturges’ “The Magnificent Seven”, as a western remake of Akira Kurosawa’s masterpiece “Seven Samurai” and for all purposes it will work again as director Antoine Fuqua reunites with movie star Denzel Washington for another fall release. Most assuredly, this blockbuster release, which wanted to separate itself from Remake Summer, will make a ton of money at the box office – but is that all it will do? Set in the small town of Rose Creek in 1879, in what is presumably the southwest (although most of the movie was filmed near Baton Rouge, Louisiana with a few stops in New Mexico), the story wastes no time diving right into set-up before the movie’s title appears. We’re introduced to arrogant industrialist Bartholomew Bogue (Peter Sarsgaard), who along with his henchmen, “offers” to purchase all the land from the locals for a fraction of its worth, since it’s near a gold mine. His fair warning is that his offer stands for three weeks and if they don’t sell their land to him by then or vacate entirely, Bogue has promised to return and take the land by force, but before he exits, the ruthless villain uses some of that force….cue title card. Emma Cullen (Haley Bennett,”The Equalizer”) leaves Rose Creek with her friend Teddy Q (Luke Grimes “American Sniper“) and travels to nearby Amador City in search of help to defend their homes and drive out Bogue and his crew. They persuade bounty hunter Sam Chisolm (Denzel Washington), offering him everything to take out Bogue. Impressed with Emma’s persistence and pursuit of righteousness, Chisolm agrees and begins to recruit a band of outsiders for the job. 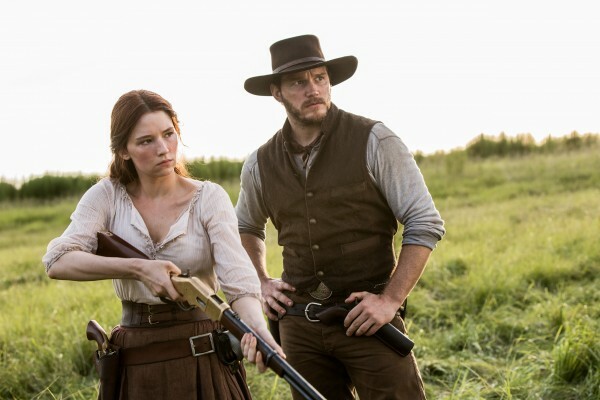 They don’t travel too far before they meet incorrigible Irish Baptist gambler Josh Farraday (Chris Pratt), who agrees to join Chisolm recruit others. Chisholm hunts down one of his bounties, a Mexican outlaw named Vasquez (Manuel Garcia-Rulfo) and offers him a spot on his posse. Faraday runs into two hustlers, sharpshooter Goodnight Robicheaux (Ethan Hawke), and a knife-wielding Korean assassin named Billy Rocks (Byung-hun Lee, “I Saw the Devil“) in Volcano Springs. On their way back to Rose Creek, they’re joined by burly tracker Jack Horne (Vincent D’Onofrio), and a lone Comanche Red Harvest (Martin Sensmeier) and the seven ride in to deal with the town’s oppressors. From here, there are some good action scenes, like watching the seven clean up Bogue’s tough guy remnant upon their initial arrival, but the screenplay by Nic Pizzolatto (HBO’s “True Detective”) and Richard Wenk (“The Equalizer”) continues to just fall in line with the aforementioned formula – because it works. If it’s not broke and all that. Yes, it’s a familiar story, but Fuqua also incorporates very familiar conventions of westerns (or action flicks) in unraveling this formula. There’s a training montage of the seven teaching local farmers, preachers and business owners how to shoot guns, use knives and implement strategy. Some of it is humorous, but most of it is overlong and doesn’t have enough of the character-building moments needed to truly get to know these seven. Eventually, we wind up witnessing the inevitable climactic showdown, where everyone works together to fend off Bogue and his army of men, despite being outnumbered. One thing that irked me from the onset with Fuqua’s remake is Sarsgaard as the villain. I know he has his fans and I think he’s a fine actor (check out “The Experimenter“) – at least better than what the material calls for here – but, he just annoyed me here. His character, the choices he made, his mannerisms – I was annoyed by all of it. He looks like he could keel over from tuberculosis at any moment or is addicted to some kind of drug (if that’s the case, then the writers should’ve incorporated that into the script) and Sarsgaard gives him look, a glare, throughout almost the entire movie. This movie needed a villain who didn’t think he was a villain. Bogue could’ve simply seen himself a businessman and an opportunist, one who could manipulate and persuade the townspeople into selling their land, leaving only a few who saw through this greedy charade to seek help. But, the perpetually sweaty Skarsgard, with his slicked back hair and goatee, feels like such a stock character and similar to one of the many smarmy scumbags he’s played in the past. As for the cast assembled to play the Seven, Pratt stands out as the MVP. After “Guardians of the Galaxy” and “Jurassic World“, he’s managed to effortlessly nail down this devil-may-care attitude and with his sly charm and sense of humor, Pratt is a much-needed presence to balance out Washington’s seriousness. He’s fun to watch and happens to be the most understandable of the bunch (what I mean is, for some reason, many of Washington’s lines were incoherent mumbles and the same could be said for some of the other Seven, but Pratt I could understand). Together, they are the Brynner and McQueen from the original and they make a good pair. Washington, rides in under the hot sun atop a black horse, dressed in all black, plays Chisolm with the kind of steely-eyed mystery you’d expect from the actor. And that’s just it – Denzel is once again playing Denzell (kind of like how he was in “Flight“), but the fact that this is his first Western makes up for any familiarity he exudes here. He makes for a fine gunslinger with impressive skills and it’s great to see him lead the most diverse iteration of the Seven series that we’ve ever seen grace the big-screen. Hawke and D’Onofrio are the more recognizable (or seasoned) of the other five and they’re each given enough character traits and personality to standout. Hawke’s character, who has a ridiculous name and is an amalgam of James Coburn and Robert Vaughn’s characters in the original, is clearly haunted by some form of PTSD from his past (possibly a connection to Chisolm’s past as well, but that’s never really addressed) and D’Onofrio’s Jack Horne has a tight connection with the Man Upstairs, based on his prayers and scripture quotes. When his bushy-bearded character is introduced, you can’t help but to chuckle at his mountain man physique and then the sound of his high-pitched voice. I’m not sure where D’Onofrio was going with the character, but I enjoyed it. He goes all in, with a glint in his eye and a commendable robust energy, providing the group with the kind of heart and humor that Ernest Borgnine used to offer westerns back in the day. Both actors invest in a good amount of squints and twitches, yet I also had to strain to understand their dialogue clearly as well….maybe it’s my middle-aged ears. I will say it’s cool to see Washington and Hawke share the screen again under the guidance of Fuqua. They have some good moments together and it will definitely remind viewers of their “Training Day” chemistry. Washington also has some good conversations with Pratt and these scenes left me wanting more of them and less of all the action. The biggest thing this “Magnificent Seven” is missing is a natural camaraderie and respect amongst the Seven. Sure, they eventually work together, but it feels like their union has been formed because that’s what we expect. It seems really cliche for Pratt’s Faraday to crack wise at the expense of Vasquez’s ethnicity. So, despite an obvious display of diversity, the writers are going to make fun of the Mexican? Why bother then? Also, I really have no clue why Red Harvest or Jack Horne joins the gang, except for the fact that we need a sixth and seventh spot. Apparently Horne has a history of slaughtering Native Americans for the government, yet he’s working alongside a Comanche now without a hitch. And what compels these two to risk their lives? Once they’re all assembled, there’s a scene where they’re all riding together and Faraday and Vasquez are trading verbal jabs and Faraday says, “See? We’re bonding!”, as if the line was solely to convince the audience. If you have to say it out loud, then it’s not natural. 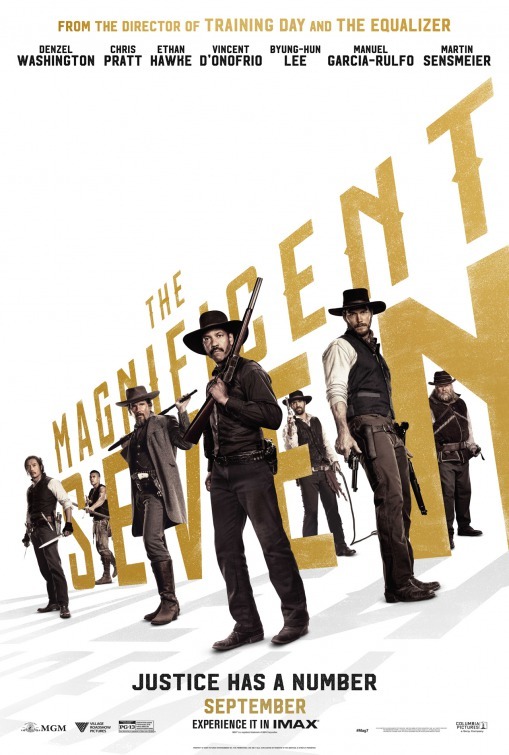 The MPAA has branded “The Magnificent Seven” with a PG-13 rating, probably because there’s not enough F-bombs or naked flesh to warrant the movie’s deserved R-rating. Never mind the scene where a woman dies in the middle of the street after a hatchet digs into her back or – in what is to my knowledge one of the longest climax showdowns in the history of the genre, involving – countless pistols, rifles, shotguns, ropes, arrows, more hatchets, knives, dynamite and a Gatling gun that can obliterate a town from a couple miles away. There’s more action in this remake than in any of the four previous “Magnificent Seven” movies combined. Honestly, there is so much going on during the movie’s climax that it’s almost hard to remember that anything came before it. It all leans toward a dehumanizing of all involved, leaving the action to feel like a video game sequence or a stunt and visual effects convention. It’s almost as if the studio, the writers and the director agreed that audiences wouldn’t be able to accept this movie without an abundance of violence. That’s unfortunate. That’s also the big difference between this remake and the original, which really didn’t have that much action in it at all. 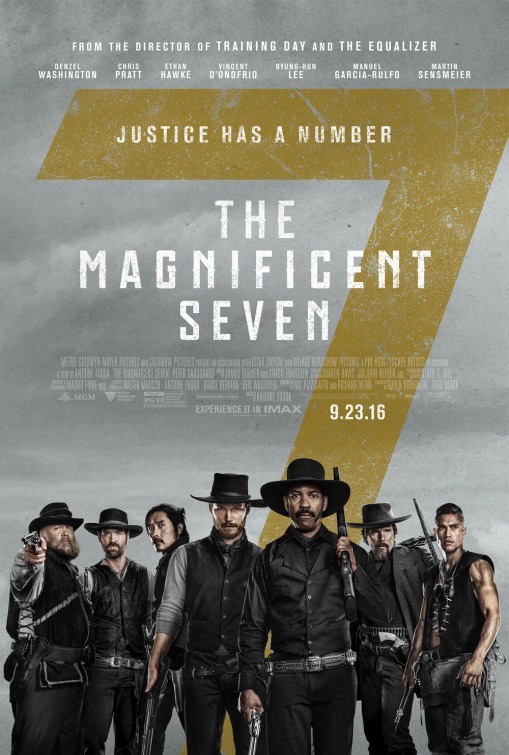 This “Magnificent Seven” isn’t all that ‘magnificent’, when you get right down to it, but like I mentioned, it’ll still make a killing.